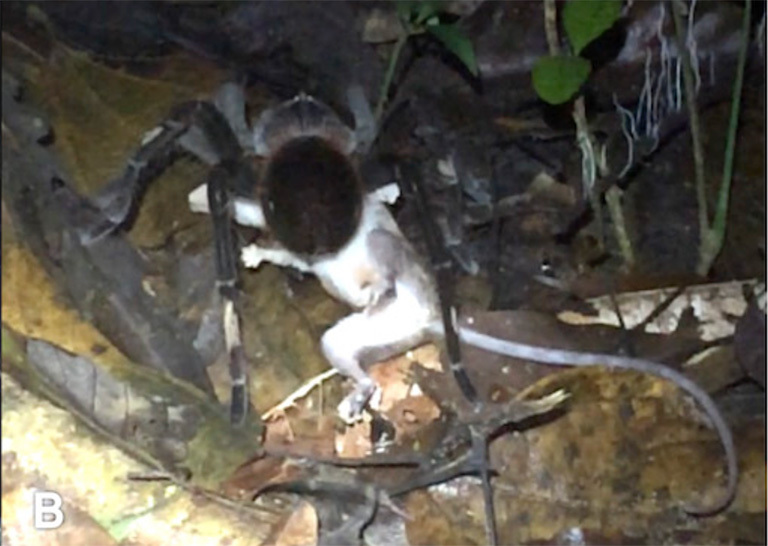 For the first time, researchers have documented a giant spider eating an opossum in the Amazon rainforest. 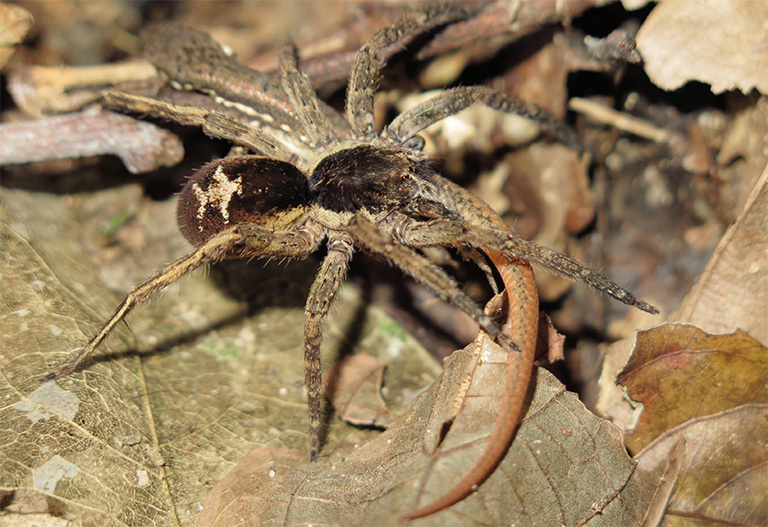 Writing in the February 28th issue of the journal Amphibian & Reptile Conservation, a team of scientists describe several rarely observed cases of invertebrates eating various vertebrates, including frogs, lizards, snakes, and even a mammal — a mouse opossum. The mouse opossum incident occurred in 2016 in the Peruvian Amazon and was captured on film by biology students. The sighting was the first of a mygalomorph spider — a group of large spiders that includes tarantulas — preying on an opossum. Writing in the February 28th issue of the journal Amphibian & Reptile Conservation, a team of scientists led by Rudolf von May of the University of Michigan describe several rarely observed cases of invertebrates eating various vertebrates, including frogs, lizards, snakes, and even a mammal — a mouse opossum. The mouse opossum incident occurred in 2016 in the Peruvian Amazon. While on a herpetological survey at night, a group of three University of Michigan biology students “heard some scrabbling in the leaf litter,” according to Michael Grundler, a University of Michigan graduate student. What they saw “shocked” them. Grundler said the tarantula was about the size of a dinner plate, while the opossum was the size of a softball, making for a dramatic and unexpected scene. Indeed, an opossum expert at the American Museum of Natural History subsequently confirmed that the sighting was the first of a mygalomorph spider — a group of large spiders that includes tarantulas — preying on an opossum. (A) The spider Ancylometes sp. (Ctenidae) preying upon an adult Dendropsophus leali; (B) the spider Phoneutria sp. (Ctenidae) preying on a sub-adult Hamptophryne boliviana. Photos by Emanuele Biggi (A) and Francesco Tomasinelli (B). (A) A theraphosid spider, cf. Pamphobeteus sp. 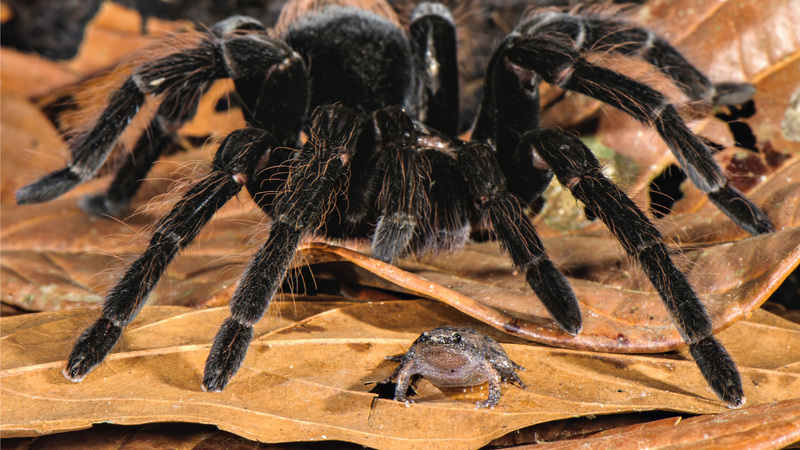 (Theraphosidae), preying upon Hamptophryne boliviana; (B) a ctenid spider (Ctenidae) preying upon Leptodactylus didymus. Photos by Emanuele Biggi (A) and Pascal Title (C). The spider Ctenus sp. (Ctenidae) preying upon a subadult Cercosaura eigenmani. Photo by Mark Cowan. The other sightings in the paper included spiders eating frogs and lizards, a waterbug eating a frog, and centipedes eating snakes — including a deadly coral snake. 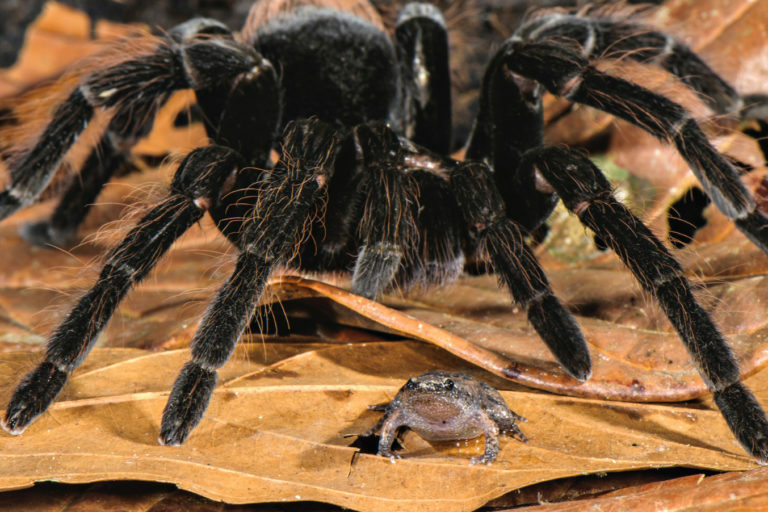 The paper also reported on parasite infections in frogs and commensal relationships between spiders and frogs, where the frogs seemed to garner protection from predators by hanging around with much larger spiders. The spider Pamphobeteus sp. (Theraphosidae) and Chiasmocleis royi. Photo by Emanuele Biggi. Citation: von May R, Biggi E, Cárdenas H, Diaz MI, Alarcón C, Herrera V, Santa-Cruz R, Tomasinelli F, Westeen EP, Sánchez-Paredes CM, Larson JG, Title PO, Grundler MR, Grundler MC, Rabosky ARD, Rabosky DL. 2019. Ecological interactions between arthropods and small vertebrates in a lowland Amazon rainforest. Amphibian & Reptile Conservation 13(1) [General Section]: 65–77 (e169).